Simon Haykin has written two books with Wiley for Communications Systems, Introduction to Digital and Analog Communications, 2e and the forthcoming revision of his classic Communications Systems, 5e. 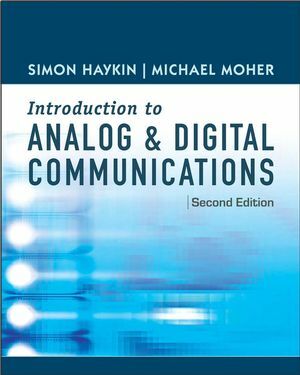 The second edition of Introduction to Digital and Analog Communications, 2e is written at an accessible level and serves as an introductory treatment of communication theory, both ana-log and digital communications. Given the highly mathematical nature of communication theory, it is rather easy for the reader to lose sight of the practical side of communication systems. Throughout the book, the authors have made a special effort to move through the mathe-matical treatment at an easy-to-grasp level, and also to point out the practical relevance of the theory wherever it is appropri-ate to do so. Drs. Haykin’s other text, Communication Systems reaches out to a higher level of math rigor. Also, Introduction to Digital and Analog Communications, 2e offers the probability coverage later in the book (chapter 8) since probability theory is not critical to the understanding of modulation. This also contributes to the accessible approach of the text. Introduction to Digital and Analog Communications, 2e is self-contained and suited for a one or two-semester course in communica-tion systems taken by Electrical Engineering juniors or seniors. The book offers flexibility for organizing the course material to suit the interests of course professors and students. SIMON HAYKIN, PhD, is University Professor and Director of the Adaptive Systems Laboratory at McMaster University. Chapter 1 sets up the motivation through the use of important and interesting applications from the Internet to Net-works and also the common radio.